New Flash Drives From Super Talent Are Super Tiny | OhGizmo! I’m a big fan of Super Talent’s USB drives. They’re tiny, weightless, high capacity, tiny, high quality, cheap, and tiny. 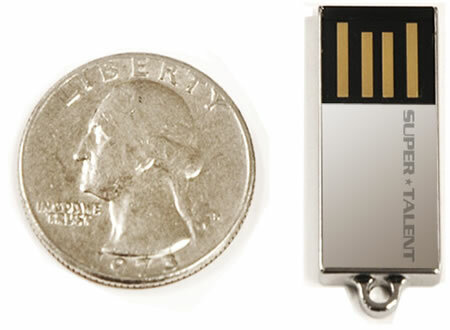 The new versions are more of all that stuff, and one of them is billing itself as “the world’s smallest” 8 gig USB flash drive, weighing less than a nickel and measuring 31.3mm x 12.4mm x 3.4mm. There are three different versions; all of them are packin’ 8 gigabytes inside, but one has a swiveling cover, one has a retracting cover, and one (the tiny one) is completely naked. They can survive shocks and being submerged in water, come with a lifetime warranty, and only cost $35 each. The cheaper 4 gig versions are available now, here, but I’d hold out for the 8 gig version if I was you. any estimate on when the 8gig version will be available? I wish I knew, ’cause I’d be first in line to replace my 2 gig model.